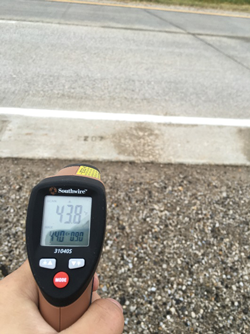 Portland cement concrete (PCC) pavement undergoes repeated environmental load-related deflection resulting from temperature and moisture variations across the pavement depth. This phenomenon, referred to as PCC pavement curling and warping, has been known and studied since the mid-1920s. Slab curvature can be further magnified under repeated traffic loads and may ultimately lead to fatigue failures, including top-down and bottom-up transverse, longitudinal, and corner cracking. It is therefore important to measure the “true” degree of curling and warping in PCC pavements, not only for quality control (QC) and quality assurance (QA) purposes, but also to achieve a better understanding of its relationship to long-term pavement performance. In order to better understand the curling and warping behavior of PCC pavements in Iowa and provide recommendations to mitigate curling and warping deflections, field investigations were performed at six existing sites during the late fall of 2015. These sites included PCC pavements with various ages, slab shapes, mix design aspects, and environmental conditions during construction. 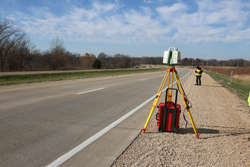 A stationary light detection and ranging (LiDAR) device was used to scan the slab surfaces. The degree of curling and warping along the longitudinal, transverse, and diagonal directions was calculated for the selected slabs based on the point clouds acquired using LiDAR. The results and findings are correlated to variations in pavement performance, mix design, pavement design, and construction details at each site. Recommendations regarding how to minimize curling and warping are provided based on a literature review and this field study. Some examples of using point cloud data to build three-dimensional (3D) models of the overall curvature of the slab shape are presented to show the feasibility of using this 3D analysis method for curling and warping analysis.